Genetic risk: Mustafa Sahin studies tuberous sclerosis, a rare genetic disorder that leads to autism in about half of the cases. Whole-genome sequencing studies published in the past few years suggest that there are somewhere between 100 and 1,000 rare genetic causes of autism. This realization has led to two recent scientific trends: a growing interest in disorders caused by a single gene that often lead to autism and the motivation to find a common pathway among the various genetic causes of autism. I would like to argue that tuberous sclerosis (TSC) — a rare genetic disorder characterized by non-cancerous tumors throughout the brain and body — provides us with a unique opportunity to make progress on both fronts. Epidemiological studies indicate that between 43 and 86 percent of individuals with TSC have autism1. More recent prospective studies have consistently demonstrated that about 50 percent of people with TSC can be diagnosed with autism using the Autism Diagnostic Observation Schedule and the Autism Diagnostic Interview-Revised, well-established measures for diagnosing autism2,3. This rate of association with autism is higher than that of many other genetic syndromes associated with the disorder. More importantly, this rate is significantly higher than the 20 percent risk of autism in the infant siblings, or ‘baby sibs,’ of affected children, a group that is widely studied to identify early biomarkers of autism. So, infants with TSC represent a group of children with a high risk of developing autism. Clinicians can diagnose many individuals with TSC before or at birth. One of the manifestations of TSC is a tumor in the heart that is easily detected on an ultrasound or echocardiogram. These heart tumors, called rhabdomyomas, usually occur early in life and disappear without intervention as the child gets older. A multi-center trial published in 2003 demonstrated that a fetus or newborn with multiple cardiac tumors has a 95 percent chance of developing TSC4. In our experience at Boston Children’s Hospital, cardiac tumors are the most common sign of tuberous sclerosis in the first year of life5. This provides us with a newborn screen or biomarker for early diagnosis, and a unique opportunity to investigate the development of autism, as well as a time window in which to intervene. Because about half of the newborns with TSC will develop autism and we can identify these individuals starting in the perinatal period, we have the opportunity to ask a simple question: Can we predict which infants with TSC will go on to develop autism? This question is also being queried in baby sibs. However, there are some advantages to choosing children with TSC for this project. 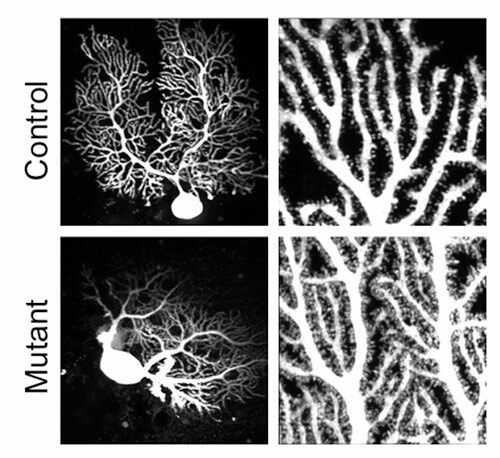 Abnormal connections: Neurons lacking the TSC1 gene (above) have abnormal shapes and denser branches than do controls (top). First, the risk of autism among TSC children is higher than that of the siblings of children with the disorder. Second, and maybe more importantly, TSC children make up a genetically identical group compared with those with other forms of autism. Tuberous sclerosis is caused by loss-of-function mutations in either the TSC1 or TSC2 gene. The main cellular function of TSC1/2 proteins is to put a brake on the activity of the mammalian target of rapamycin, or mTOR pathway. When mTOR is active, cells make proteins and lipids. TSC1/2 proteins keep mTOR activity in check and do not allow cells to grow out of control. When you have mutations in either TSC1 or TSC2, mTOR becomes hyperactive and the cells become enlarged in all affected organs. Because mTOR is also crucial for the functioning of the immune system and for preventing the formation of tumors, many laboratories around the world that study cancer and immunology, as well as neuroscience, are investigating this pathway. As a result, we know a substantial amount about the mechanisms underlying TSC compared with any other single-gene disorder associated with autism. As a result of the intense research on mTOR from various disciplines, half a dozen compounds that inhibit mTOR activity are available from pharmaceutical companies. In fact, the U.S. Food and Drug Administration (FDA) has approved three of these drugs — rapamycin, everolimus and temsirolimus — for treating various tumors. Rapamycin has been around for more than a decade, and researchers have investigated its effects in children after kidney, liver, intestine and heart transplantation. A large amount of data are available about its safety in this age group, aiding the design of trials using mTOR inhibitors in children with TSC. We are conducting the first phase II clinical trial of everolimus in children with TSC, investigating its effect on cognitive ability. We also plan to look at secondary effects on the symptoms of autism, epilepsy and problems with sleep. Based on the results of this trial, others are likely to follow. As Eric Kandel, director of the Kavli Institute for Brain Science at Columbia University in New York, eloquently stated in his Viewpoint article, one of the major unanswered questions in autism research is the identity of the brain regions and types of neurons that are primarily involved in the disorder. Unlike for amyotrophic lateral sclerosis, Parkinson’s or Huntington’s disease, we do not yet know the primary site of dysfunction in autism. Parallel studies in mouse models and people with TSC may shed light on this important gap in our knowledge. It is becoming clear that neurons lacking TSC1 or TSC2 have abnormal projections (axons) and signal-receiving branches (dendrites), and form defective junctions (synapses). It is also clear that not every neuron or circuit in the brain of an individual affected with TSC is dysfunctional. A remaining challenge is to use the power of mouse genetics and human neuroimaging to identify the circuits underlying features of autism in TSC. Taken together, the ability to diagnose at an early stage, an understanding of the genetics and cell biology of the disorder, and the presence of FDA-approved small molecules that can be used in clinical trials make TSC a unique genetic disorder among those that lead to autism. Given the advances in the generation of mouse models of TSC and the preclinical trials that are ongoing with these models, I envision a day, not too far away, when a child born with TSC will undergo biomarker testing that will determine whether he or she is at risk for developing autism. Clinicians could then treat the child accordingly, with a combination of behavioral therapy and drug treatments. Such a day will be a triumph not only for TSC but also for other related neurogenetic disorders that lead to autism. 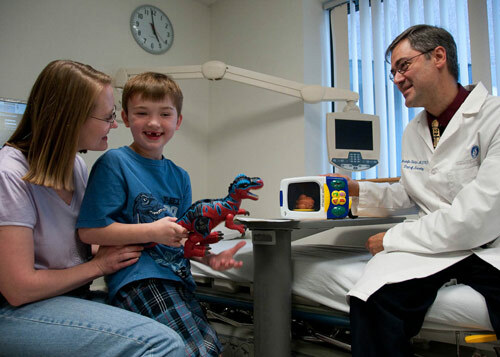 Mustafa Sahin is associate professor of neurology at Boston Children’s Hospital.